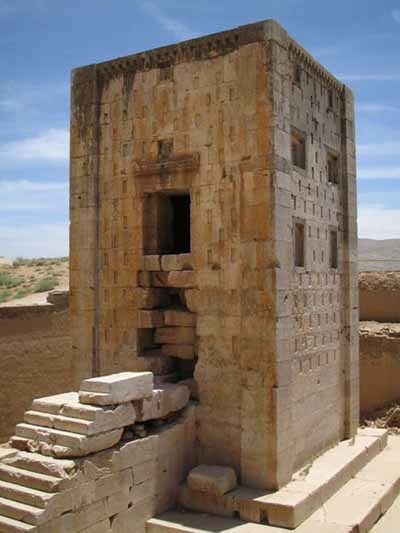 The Cube of Zoroaster (Ka'ba-ye Zartosht), located 3-4 kilometers from Persepolis at Naqsh-e Rostam, beside Zangiabad village in Marvdasht county in Fars. The distance from the mountain is 46 metres (151 ft) and is situated exactly opposite Darius II's mausoleum. The local name of the structure was Kornaykhaneh or Naggarekhaneh. It is about 12 metres (39 ft) high that becomes 14.12 metres (46.3 ft) including the triple stairs; and the side of each base is about 7.30 metres (24.0 ft). This structure has kept scholars and researchers guessing for its purpose for centuries, but none of their interpretations are certain. Some consider it a fire temple and say it was a site of igniting the holy fire which was used during religious ceremonies and a place for worship; some others believe it to be a treasury and a place for keeping religious documents and holy books and Avesta; while others say the chamber of Ka'ba-ye Zartosht is too small for keeping religious books and royal documents and consider it the mausoleum of one of the Achaemenid grandees due to its similarity to the Tomb of Cyrus and some mausoleums of Lycia and Caria. Also, other theories like a temple for the goddess Anahita or a solar calendar have been mentioned. Ka'ba-ye Zartosht is a stone quadrangular and stepped structure made of white marble limestone that has dentate shelves from black stone with walls marked with inscriptions cataloging Sassanid victories. The pieces of stone are scraped largely and mostly in rectangular forms and are put on each other without using mortar; and in some places, like the rooftop, the stones are connected to each other by dovetail joints. The structure is a cuboid with a thirty-stair stairway placed in the northern wall that reaches the entrance doorway. It seems that the structure has the shape of a three-floor tower that has seven doors and hatches on each floor; but only one entrance door is made true that leads inside the chamber and the others are left as blind windows. The fact that the only entrance door could be closed, makes it clear that its content should be kept safe from robbery and pollution. Currently, the structure is part of the Naqsh-e Rustam compound and possessed by the Cultural Heritage, Handicrafts and Tourism Organization of Iran.